Traditional Irish songs are alive and well. This was our finding after attending song events in pubs in County Clare recently. 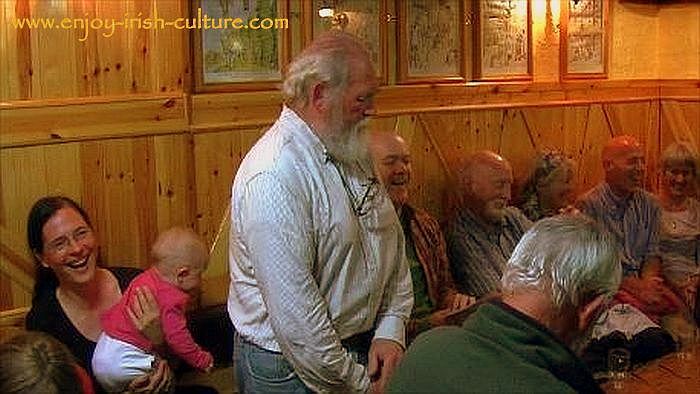 A performance at a singing session at Kinvara, County Galway, by Brien O'Rourke, composer and performer of modern songs in the traditional Irish song tradition. The tradition of Irish traditional songs is blooming even in the Ireland of today where in the dim light of the pub you can see many brightly glowing smart phone screens. Smart phone screens? I am using them as a metaphor for all the gadgets and distractions the modern world has to offer. Yet the old songs still find their way to the hearts of their audience. Why? One of the reasons we feel is that in traditional songs, whether they are in the Irish language or in English, you can feel deep passion, love and sadness. The Irish whether they will admit to it or not, are a very emotional people. In many industrialised nations today, people are brought up to live in their heads. Deep down, they are longing for exactly this heart connection that is fresh and real here. Irish songs talk about love stories, many of them sad, about loss, about love for the motherland, love for a beautiful spot of the country, or about the passion of warriors or soldiers defending the same. Some of the songs are very old. What makes a song a traditional song? Big question. What IS traditional? Only songs sung in Irish? Only local songs? Only songs that were written before a certain date, say before 1900? We think that all of these ideas would be a bit rigid. Listening to our material you will find that some of the best loved traditional songs are actually from other cultures! There always had been a lot of migration between Ireland, England and Scotland, and increasingly so in the 19th century. This resulted in folk songs being brought back and forth. Isn’t culture something that is constantly changing and evolving? A case in point is our dear friend Brian O’Rourke who writes modern songs in a traditional style. These are very cleverly rhymed using traditional techniques, and they are very funny in a timeless sort of a way which is bound to stay fresh. The oldest ones that survive today date back to the fifteen hundreds. Back then, the spoken language in most parts of the country was Irish, so the oldest songs are in the Gaelic language. 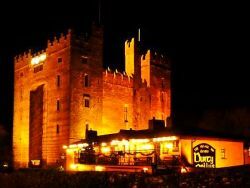 English started becoming more prominent from the early 1800’s catching on first in the cities and towns, and sweeping into Ireland from East to West. The earliest Irish songs sung in English stem from around 1800 to1830. Some songs from around that time use both languages. You might find alternating verses in Irish and English, or you might hear songs where the chorus is in English, and the verses in Irish. Sometimes, you can hear how uncomfortable people were with the new language still, trying to use it in the same ways as Irish would have been used.Irish lends itself to poetic language, but a direct translation can sound awkward. The song tradition in Ireland was an oral tradition. Singing songs and telling stories was how people spent the evenings by the fireside after a hard days’ work in the fields or later, in the factories. Communities were close in the old days. People called to each others’ houses a lot. Songs and stories, the oral ‘history’ of the community, were passed on from person to person, from generation to generation, within families and communities. Many traditional songs were lost due to the many sad turbulences in Irish history, for example the Cromwellian invasion of the mid sixteen hundreds and the rigorous suppression of Irish culture and language for the following two hundred and fifty odd years. Other songs disappeared during the Irish Famine when so many died or emigrated never to return. Hi there, really glad to meet you! Hope you will enjoy our section on Irish songs. Lots of songs to watch, and the whole tradition put in context for you on these pages! We love doing this, but we could do with a little help from you so that more people can enjoy the fruits of our labour, too! It won't take long. Just please kindly, send some social signals using the buttons at the top left or other options below. Thanks a million! Warmest regards from Susanna and Colm!